This year we kicked off 2019 with the milestone birthday of all milestone birthday’s…… a 100th bday bash! 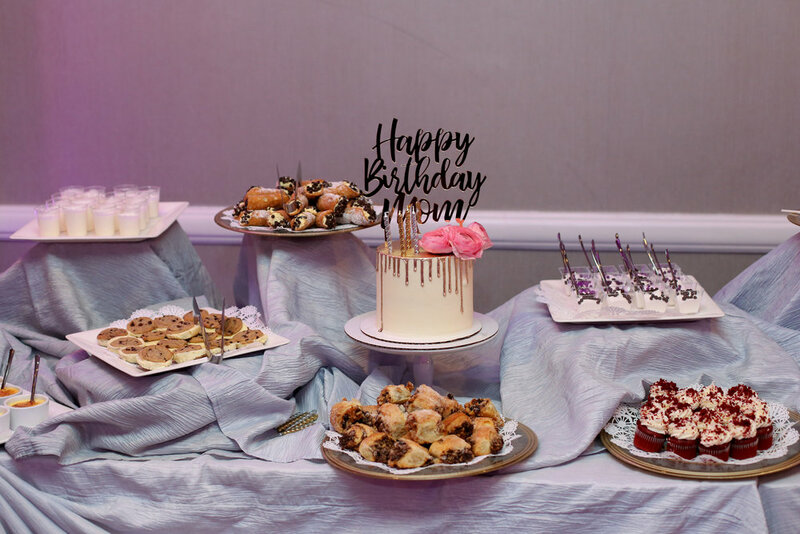 A few months ago, a long time client came to us and asked us if she could introduce us to her mother to plan her grandmother’s big day and we were thrilled and honored to be a part of such a special (and rare!) milestone. The party was going to take place at the fabulous country club in Livingstone, NJ: The Cedar Hill Golf & Country Club, where some of the family are members. 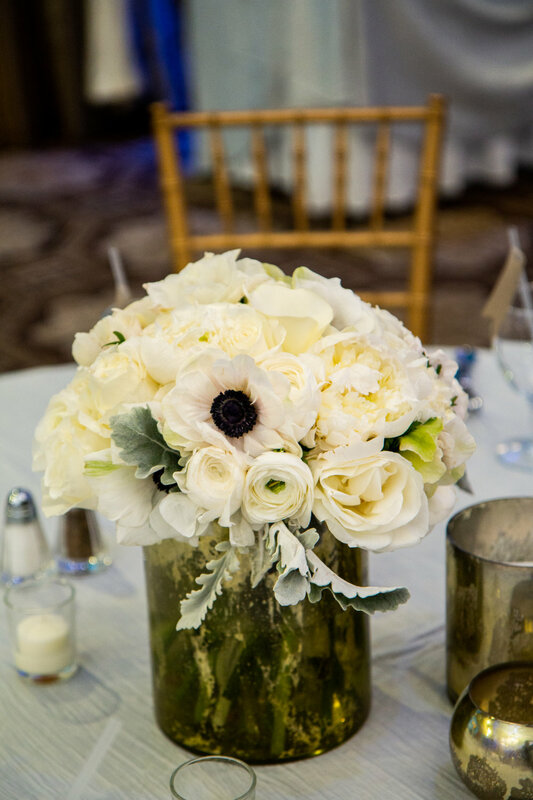 We planned the party with a sophisticated while glam color palette of gold, silver and white. As guests entered the country club, we set a beautiful floral arrangement and a large photo of the birthday girl in a lucite frame for guests to sign. After the party was over, the family took this guest sign-in board home as a keep sake. Cocktail hour was in the bar lounge where we styled the space with festive balloons, custom cocktail napkins for Bertha and simple white floral arrangements in gold and clear bud vases. The party itself took place in the club’s ballroom. Our statement decor piece was an oversized balloon garland which we placed in the center of the room. We filled it with tons of jumbo and chrome balloons to make it really pop. Later in the night, guests would be able to enjoy a delicious dessert buffet that would be styled under here. For which we got chic gold dripped cake (by Making That Cake) for Bertha to blow out a few candles. To decorate the guest tables, we alternated between jumbo balloons with amazing, custom tassel tails made by One Stylish Party and beautiful lush floral arrangements in gold mercury glass vessels. For the table of honor, Maggie got all crafty and with gold leaf paint write BERTHA in calligraphy on a jumbo white balloon so all the guests would know it was her table and of course Bertha had prime seating for the band, dancing and montage. You know how much we love to personalize our events so at every place setting we used the logo that Maggie had designed for Bertha’s 100th and created custom napkin rings and straw flags. They looked so fab! To create a “center stage” we styled a set of 100 number balloons along with more balloons creating a backdrop for photos and the band to play in front of. 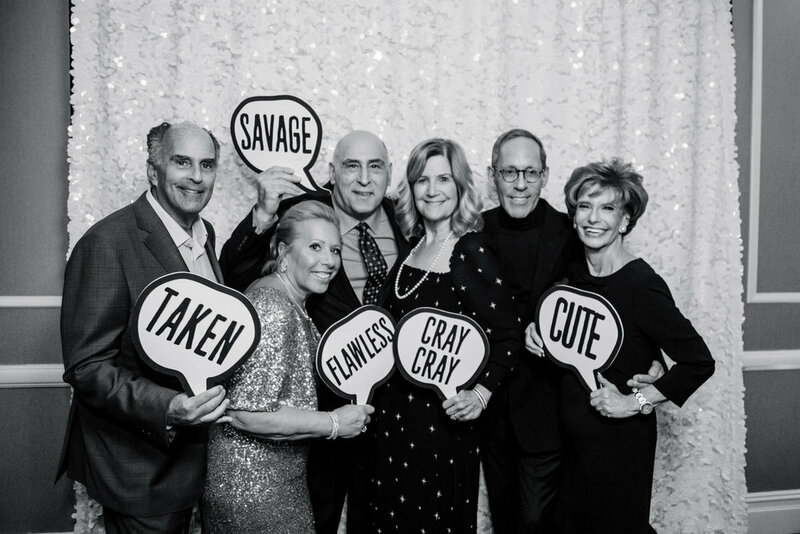 The family took tons of pictures creating beautiful memories from the evening and later in the night when dinner got started the wonderful jazz band the Creswell Club played music for the guests. As a special surprise to Bertha, her great grandson, Ben got up and played a few songs with the band on his Sax - he was awesome! As an added bonus, we brought in a Magician to walk around and preform magic tricks for the guests. They went wild for our Magician Brian McGovern, he was a total smash. Last but not least was the photo booth. Always a hit at parties especially when there is a huge family involved! Our boy Zach of Studio Z Photo Booths nailed it this time around with a white sequin backdrop and super fun props for the guests to have fun through the entire party. To end the night on a sweet note we sent all of the guests home with a custom poker chip cookie made by Biscotto Cookies since Bertha’s favorite past time is Gambling at the Borgata. How fabulous?! We really had a blast planning this monumental birthday. Here’s hoping to more in 2019!